The new, Wave Stealth AC – After 1 year in development, we release the Highest Power 802.11AC card in the market. 7 times more power and range than ordinary wifi cards, the Wave Stealth offers BLAZING FAST 1200 MBPS connect, at ranges farther than anything offered before.. by anyone. Over the last six months our R&D team has been rigorously testing this dynamic piece of hardware, and they couldn’t have been more pleased! 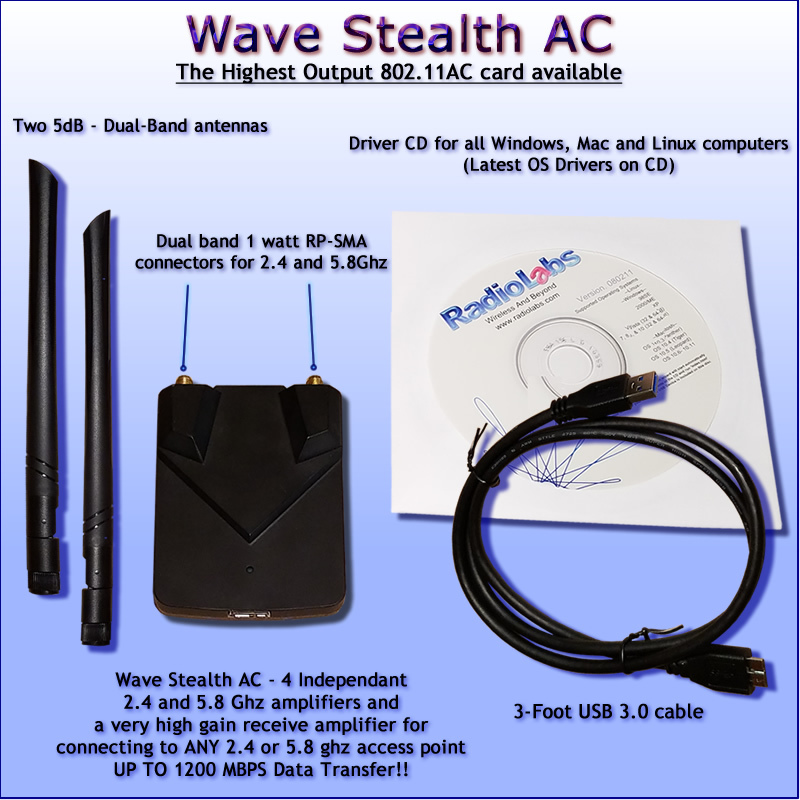 Signals that weren’t even detected on traditional internal laptop cards were easily connected to, and actually showed up with excellent signal strength and throughput using the Wave Stealth AC from the exact same location. Furthermore, with an incredible receiver and exceptional transmit power, The Stealth can easily achieve ranges greater than one mile, as long as line of sight is achieved, and the user is connecting to a high powered access point. The Wave Stealth AC, is a blazing fast 802.11AC Card with 1200 MBPS, capable of the longest range wifi possible from a notebook card. 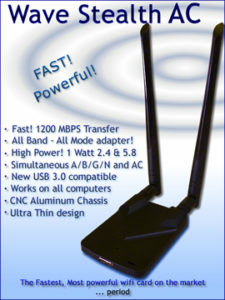 RadioLabs proudly present its newest USB Wifi Adapter: The Wave Stealth AC. This unit is an 802.11AC USB WiFi Card, designed to allow you to connect to both bands (2.4 GHz & 5.8 GHz) at further distances than ever before, now with the benefits of blazing fast speeds! The Wave Stealth AC, is the perfect long range companion, to our 802.11AC – High Power Router, for extending wifi networks across large properties, homesteads, ranches and areas where normal wifi just won’t work. Ranges in excess of 1 mile can easily be achieved between both the O2Air-AC, and the Wave Stealth. The Stealth will work on any wifi network for greater coverage than possible with other adapters. Connect to literally any standard wifi router, 2.4, 5.8 or both. High Power Receiver – The Wave Stealth AC, puts ordinary WiFi cards to shame, not only in it’s ultra high power, 4 channel amplifiers, but the receiver is the best we’ve ever produced. Able to pick up signals, we had never seen before from some of our other High Power USB wifi cards, we are thoroughly impressed with all levels of performance the Wave Stealth AC offers. With 8-10 times the power of standard WiFi cards, the Wave Stealth, 802.11AC, USB High Power 1-Watt card packs big performance in a small, light weight CNC Aluminum chassis. Long Range 802.11AC WiFi card, has excellent range and sensitivity. As advancements are made within the 802.11 protocol, manufacturers of wireless equipment must evolve and produce new equipment to fully capitalize on these technological gains. RadioLabs, an industry leader in long range wireless equipment for over a decade, has quietly been working on our new line of AC equipment. First, we shook things up when we recently released our O2 Air AC high powered dual-band router, and now our next offering- The Wave Stealth AC. With its sturdy, yet sleek design, this new unit is built to provide you with years of exceptional quality wireless connectivity. No more laggy video streams, no more buffering, crystal clear VoIP calls, and better yet, MORE OPTIONS. Now you can actually detect and connect to either 2.4Ghz and 5.8Ghz networks independently, or connect to any 802.11AC access point on both frequencies , for blazing fast 1200 MBPS AC wireless speed, with never before seen throughput and RANGE. Also, with its simple driver installation process, users will be surfing networks in no time. RadioLabs, the industry leader in long range wifi equipment, has created another easy way to provide your computer with long range wifi connectivity with minimal equipment. The Wave Stealth-AC, High Power 802.11AC USB WiFi Card from Radiolabs is a plug and play WiFi system that only requires a USB port to get you online. The Stealth-AC will dissipate heat super fast and is so stealthy no one will notice it! 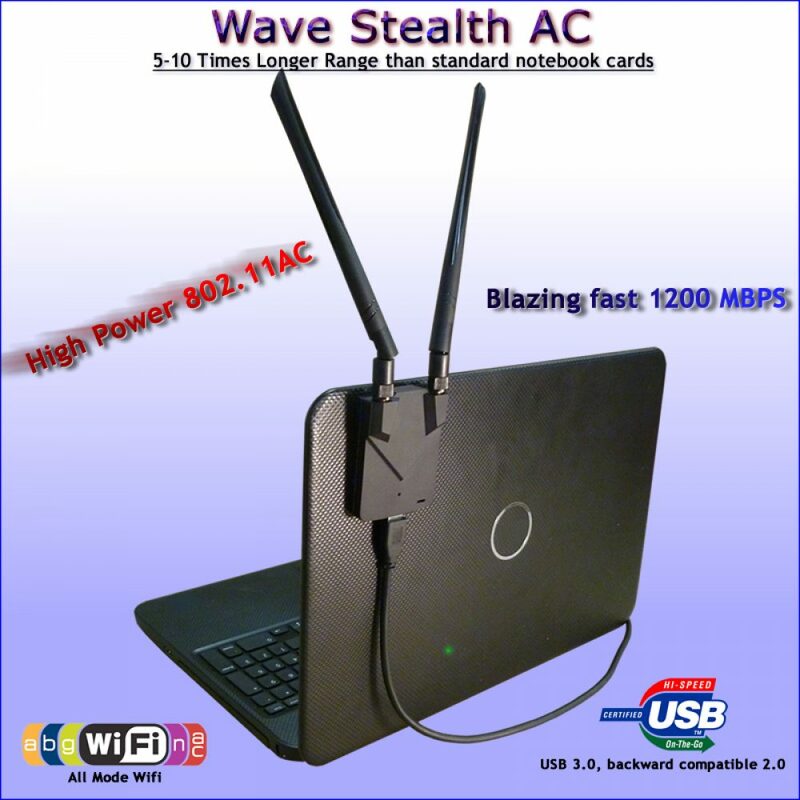 The Wave Stealth-AC supports speeds up to 300Mbps for 2.4GHz networks and up to 867Mbps for 5.0GHz networks when connected to your pc’s USB 3.0 port, utilizing 802.11AC Wi-Fi technology, providing you with superb performance. The unit offers users stronger, stable links to normally out of reach networks, making it ideal for high bandwidth activities and lag-free HD video streaming. The Stealth features two RP-SMA antenna ports, and two 5 dBi dual-band antennas, which are detachable and can easily be upgraded for even more power. The antennas, coupled with the Stealth’s power amplifier, increase reception to such a degree that you’d be hard pressed to find a more powerful AC network adapter on the market! The Wave Stealth AC, comes with a 3′ (36 “) detachable USB 3.0 Cable, which can be used with any computer which has a USB port. Note: Drivers are compatible with all Windows PC, from 98, to Windows 10. Works on all MAC OSX and Linux. Drivers included for one time install. We have drivers for every operating system available, on CD included in the package. Bus Type USB Version 3.0 – 2.0 and previous compatible. 802.11AC – 1192 MBPS Throughput standard, dual band operation with most routers. Full compatibilty with fastest 1200 MBPS guaranteed on RadioLabs O2Air-AC high power 802.11AC router for blazing fast network speeds. 802.11N Mimo with internal antennas – Data rates of 150 and up to 300MBPS can be achieved. AC is out, but there’s zero need for it in real world scenario. Operating Power 5.0V (USB Only) – New Repeater coming soon, to use Wave Stealth AC’s brute power, across your entire network! All sensitivity outlined, is based on low potential noise floor. Greater working range possible depending on access point. During initial testing, RadioLabs was able to connect to an external access point, 2.8 miles away, line of sight, RV park using external access point. Your mileage may vary. Theoretical line of sight, perfect conditions, over flat ground – 4 miles. WiFi Protect Access WPA-WPA2 (AES, 64, 128, 156-bit WEP with shared key protect access) Every currently available encryption type. Wibberduck Antennas. Mimo operation, 4x mimo multiplex. IMPORTANT: The Key to RadioLabs successful USB Wifi card designs and why no other company in the industry can achieve the high level of power and rock solid receiver performance, is because of thermal energy transfer design. To increase the output power, increases the chipset’s heat. Some of the amplification process in wifi amplifiers output, produces heat. This heat builds up FAST. Our adapters to get slightly warm to the touch, but imagine what a poor processor or chipset would do if you didn’t put a heat sink on it? This is what happens to our competition’s cards, and why we get so many people ordering our high performance wifi cards.. because quite simple.. they work! You will see other cards offered by other companies, listing large power output figures. They will achieve some performance for a small amount of time, from 10-15 minutes, then a clamping effect takes place, and the performance of both the chipset, and the power amplifier takes place, and the connection drops, or becomes so weak and unstable, the card’s performance is no greater than an ordinary low-power card. No other wifi card in the industry can achieve the same level of performance, because of one thing. Their designs trap the heat inside of the card’s chassis, causing thermal runaway and shutdown. Unless the card you are buying is aluminum, and careful attention to the design is factored in, thermal transfer effect is taking place and your card’s performance will gradually shut down within 5-15 minutes. Ultra-thin, CNC aluminum chassis, changes the look and feel of all our previous High Power cards. Thin aluminum produces cooling and looks great! RadioLabs has taken long range wifi RV / Marine WiFi and put it in the smallest package yet. 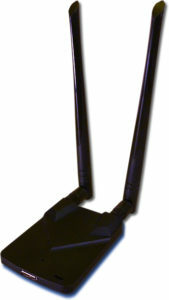 The CaptiFi is everything you need to extend your wifi antenna range in a unit you could almost put in your pocket. The New, Revolutionary o2Air-AC, 802.11AC long range, high power router, is a highly advanced network gateway router, that is the centerpiece of your network. With long range and blazing fast networking speeds, the O2Air makes network lag and streaming high resolution video delay a thing of the past. RadioLabs’ new USB WiFi Directional Antenna, O2Connect is designed to be a fixed mount, long range wifi panel antenna with high speed B/G/N, 150 Mbps, USB module built in. RadioLabs’ new chipset gives 2x the power and twice the receive sensitivity for very long range connections and point to point bridging up to 5+ miles – Line of Sight.